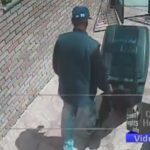 A package thief was caught on surveillance camera stealing a package from a porch on President St in Crown Heights. 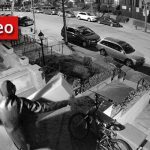 The footage shows as the thief scouts out a Fedex driver delivering a package, rounds the block, and walks right onto the porch to take the package. A brazen thief was caught on surveillance camera stealing a package that was left just minutes before by a Fedex driver. The incident occurred Sunday at 12:30pm on President St near Troy Ave in Crown Heights. The surveillance footage shows as the Fedex driver enters the house gate, walks up the stairs, and tosses the package behind the porch wall. Meanwhile the thief can be seen waking by carrying a bag and taking a quick glance at the house. A few minutes later, after coming around the block, the thief walks right up to the gate, and up the porch. He takes a glance around and places the package in the bag he was carrying, and makes off with his loot. 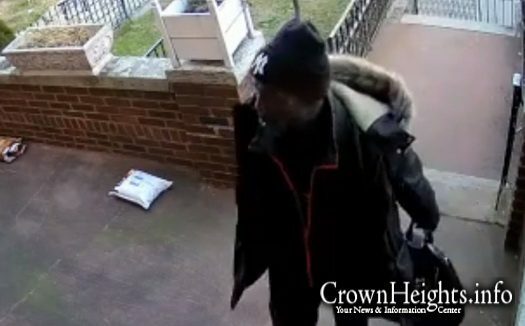 During the holiday season, package thefts become increasingly common, with many incidences reported in the Crown Heights area. How come the driver isn’t required to ring the doorbell? Its time to repackage packages with garbage and leave on porch for these thieves.